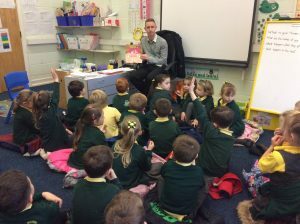 Our new Year 1 Book Club children are enjoying sharing stories with their friends. Today we read ‘The Gruffalo’s Child’ by Julia Donaldson. Year one book club are reading books by Julia Donaldson. Today year one book club enjoyed listening to the story, ‘Theres’s a Pig up my Nose’ by John Doherty and Laura Hughes. They found it very funny.